Cromarty Image Library - Cromarty Football Club - c1939??? Cromarty Football Club - c1939??? Picture taken in the Victoria Park - the War Memorial can be seen on the hill in the background. The person at back left is in uniform. Back row (left to right); Gaffer?, Roland Cooper, Kenny Macfarlane, Eddie Scott, John Gillies, John Mcleman & ?? Front row; Davie Bremner, Bobby Hogg, Ewan Gillies, Kenny Maccauley & Bertie Whiteman? Back row, 2nd from left is Ronald Couper. Hi Andrew - My name is Alan Whiteman. 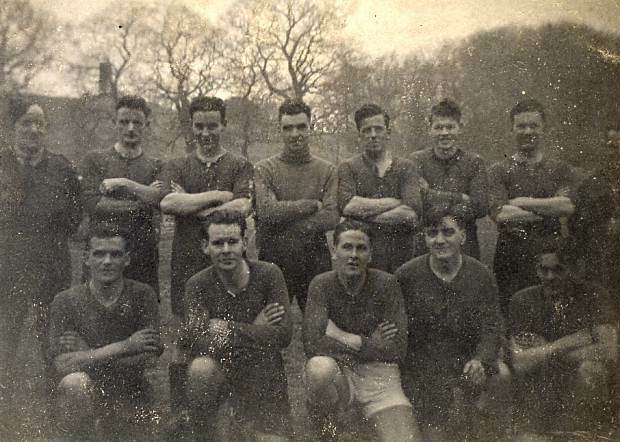 Although I believe my Dad played for the club b 1939 he was in Edinburgh studying for a CA degree. Also I dont think it looks like him as he was blond at that time but you never know. He was great pals with Bobby Hogg.